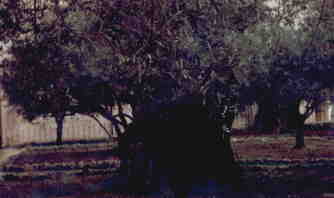 One of the eight remaining olive trees in the Garden of Gethsemane (just east of Jerusalem), the oldest of which is 3000 years old. Panaramic view of modern Jerusalem. 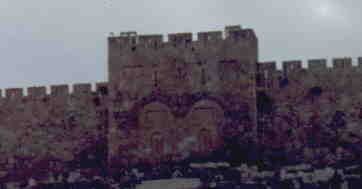 The Golden Gate, on the eastern wall. 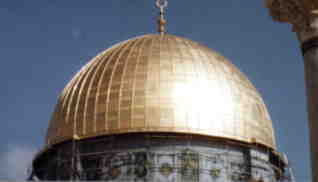 The Dome of the Rock, which stands on Mt. Moriah, where the temple used to be. 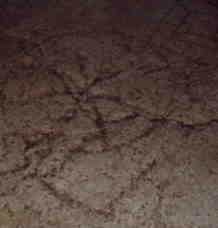 The "King's Game" (that Roman soldiers used to play) carved in the floor of what would have been the basement/prison of the Antonia Fortress, where Jesus was condemned by Pilate. 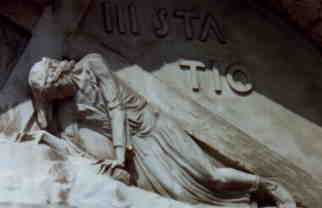 A sign marking one of the stations of the cross along the Via Dolorosa.